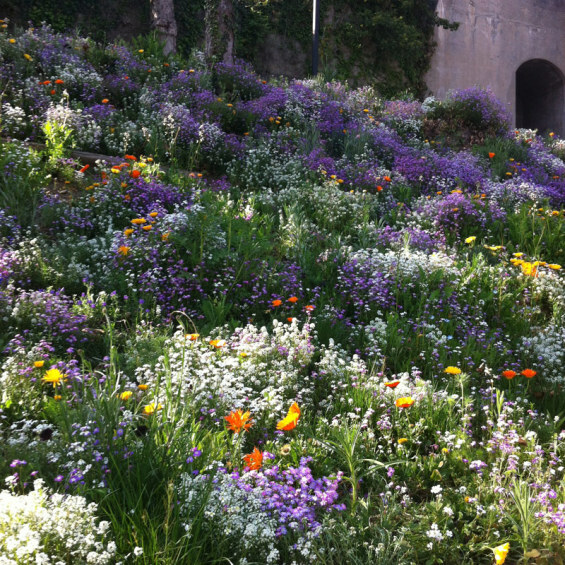 The new park covers about 3.5 acres and it is located on the hill near the Castello di Rivoli Museum. The castle is part of the crown of Savoy, built in the 17th century. In the 1990’s it was restored to exhibit important collections of contemporary art. The Park area is fully isolated from historic stone walls sides and the land is strong inclination. Inside it was groves century trees and wild vegetation. Beautiful historical plane trees were planted in the 19th century, when the area was transformed into a garden built by Lord Melano. There is an allele of trees of 200 year old Platanus orientalis. When they were planted in a special candelabrum-shaped form but in recent years have not been maintained and have grown with stability and security problems. Initially, the area was infested with weeds such as Rubus, Altianhus regia, Robinia pseuacacia, Sambucus nigra and herbaceous vegetation that covered the whole area, which blocked the entrance to the Park making entering the site difficult for the team to make proper analysis and surveys. The team surveyed and catalogued over 360 large trees including historical trees. The city of Rivoli has deemed the site a public park and commissioned a new Park project. The project started in the 2012 the design phase and in to 2013 the construction phase, with the park opening to the public in March 2014. Over recent months the park has had many hundreds of visitors and the new park is most appreciated by the local citizens. Main idea was to design a park where nature is the dominant element. 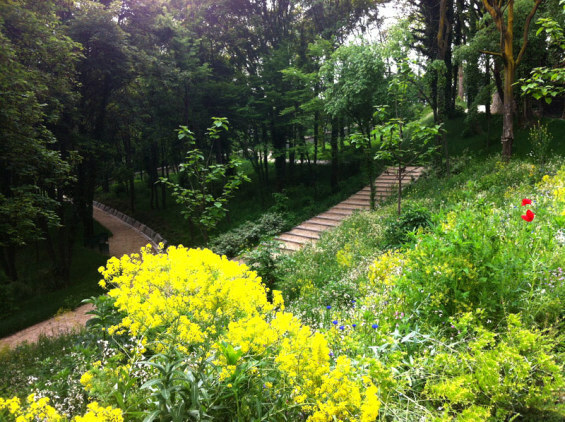 The new Park was intended to be like a garden but with with the characteristics of a nature reserve. The transformation has focused on the vegetation and creating new paths for visitors. The process of naturalize started with freeing the area of weeds and cleaning up and pruning historical plants to allow easy and secure access for the public. In some areas, the weeds species mixed with seeding on flowering meadows and many invasive species was selected and left to grow naturally. The only tree introduced was the Pawlonia tomentosa why is not native. It is a tree that grows fast, has very large flowers and a tree visibly outsider. This choice was made because this is a tree that grows fast, has very large flowers. It is the exotic element inserted in the 19th-century garden. 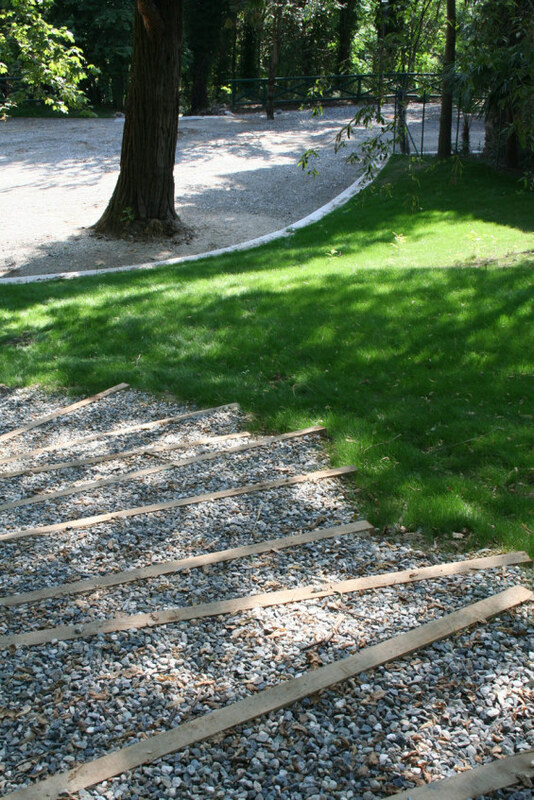 All materials were selected for their eco charateristic, with all park roads and public squares using permeable paving using Roman method called calcestre. The park lanes were setout by maintaining existing trees and the surface water is captured and used within the park with a system of wells. This project primarily turned an overgrown forest into a place where the human presence is not disruptive to animals and where the vegetation will provide food for local fauna. The reclamation of the area has made this park accessible to everyone by providing a green area with a high level of biodiversity.